Most laboratories employ an ECG-gated 2D inversion recovery prepared; interleaved k-space segmented gradient recalled echo (IRISGRE) sequence acquired in a single breath-hold for assessment of myocardial viability through delayed enhancement. We have observed a septal mid-wall hyperenhancement in many clinical images acquired using IRISGRE with low-high (from ky = 0 outwards +/- Kymax) phase encoding order (PEO). We have identified this enhancement as an imaging artifact by changing the phase encoding direction (PED). As shown in a representative short axis slice (Figure 1a, b) the change of PED from anterior-posterior to foot-head direction moves the mid-wall hyperenhancement from the septal and lateral to the anterior and inferior myocardial walls (arrows). The continuous evolution of the post-inversion recovering signals cause modulation of the k-space data. Modulation of k-space for the IRISGRE sequence depends on: 1) approach to steady state; 2) readout duration for each shot; and 3) PEO; apart from other factors like, varying time of inversion (TI) for patients with variable heart rate. As PEO controls the distribution of the evolving signal along the PED of the k-space, it directly influences the point spread function (PSF) . The analysis shows that PSF has significantly less oscillatory lobes (edge ringing) for the linear PEO (from +/- kymax toward -/+ Kymax) compared to the low-high PEO. In addition, on low-high PEO the acquisition starts at TI and continues for the complete shot duration, thus allowing twice the signal recovery time compared to linear PEO, leading to the edge enhancement. 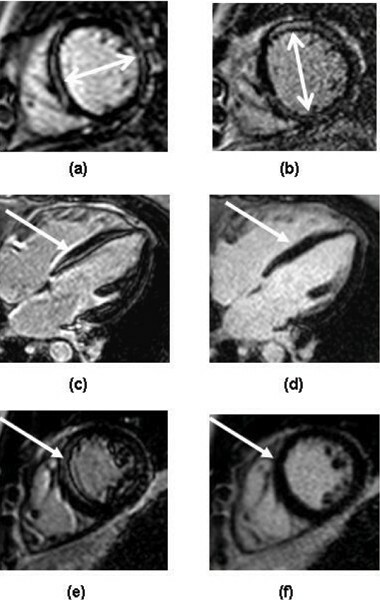 IRISGRE images of the same subject acquired using low-high PEO and (a) AP and (b) FH PED. IRISGRE images of the same subject acquired with (c, e) low-high and (d, f) linear PEO. White arrows indicate the artifact. Clinically significant artificial hyperenhancement due to edge enhancement and ringing resulting from low-high profile order is suppressed by using linear profile order for inversion recovery prepared interleaved segmented GRE sequence in delayed enhancement imaging for the assessment of myocardial viability. The purpose of this study is to assess the clinical significance of the edge enhancement and ringing as an effect of PEO used for IRISGRE in delayed enhancement (DE) myocardial images. Studies were performed on 7 (4 males) clinical patients, with a mean age of 45 (range 31–60 years), three of whom showed true hyperenhancement. Imaging was done on a 1.5 T, Philips Intera clinical scanner, using a 5-element phased-array surface coil with vector-cardiographic (VCG) gating. The 2D IRISGRE images (33 k-lines per R-R, TR/TE/flip: 5 msec/3 msec/15 deg; acquired spatial resolution: 1.7 × 2 × 8 mm3) were acquired 12 to 15 minutes after contrast injection using linear and low-high PEOs. Each slice was acquired during suspended respiration (10–12 heartbeats). The optimal TI was determined using a Look-Locker sequence. An experienced CMR reader evaluated the images. In 5/7 patients a septal mid-wall hyperenhancement was observed with low-high PEO that changed myocardial wall position with change in the PED (Figure 1a, b). In all 5 patients the artificial hyperenhancement was eliminated with linear PEO. Representative IRISGRE images acquired on the same patient using low-high (c, e), and linear (d, f) PEO are shown in Figure 1. The white arrows indicate the mid-wall artifact on those images acquired with the low-high PEO. This study reveals the significant clinical impact of the PEO in IRISGRE. The artifact with low-high PEO was observed to be dominant in the septal myocardial wall where ringing from the left and right endocardial edges tends to overlap. This artifact has direct impact on the diagnosis of the patient images since mid-wall septal hyperenhancement can correlate to disease states such as idiopathic dilated cardiomyopathy and myocarditis. Low-high PEO with IRISGRE artificially created a significant mid-myocardial septal hyperenhancement. Linear PEO suppressed the edge enhancement and ringing which caused these artifacts. Accordingly, linear PEO should be used for IRISGRE in DE studies for assessment of myocardial viability.